If you’re a soup lover and could eat it all year long, you’ll love this super easy chicken tortilla soup! Just a handful of ingredients is needed! I’ve always been a “closet” chef. As a kid, I was always experimenting with ingredients, flavors and products in the kitchen (much to my poor brothers, the taste testers, dismay). Granted 99% of them were horrible, but it was still the act of creating them that I loved the most. That bug to invent exciting recipes hasn’t gone away, and thanks to my job at SheKnows, I’m constantly pushing the envelope with my dishes. It’s exciting, but still overwhelming at the same time. When you’re making something new that you’ve never made before, there’s always that chance of failure, that worry that it’ll turn out terribly. Normally that’s not an issue, but when you’re on the tight budget I am, any ingredients that are wasted are a complete loss of money. Because of my job, I rarely make the same thing twice. Unless it’s really, really good. 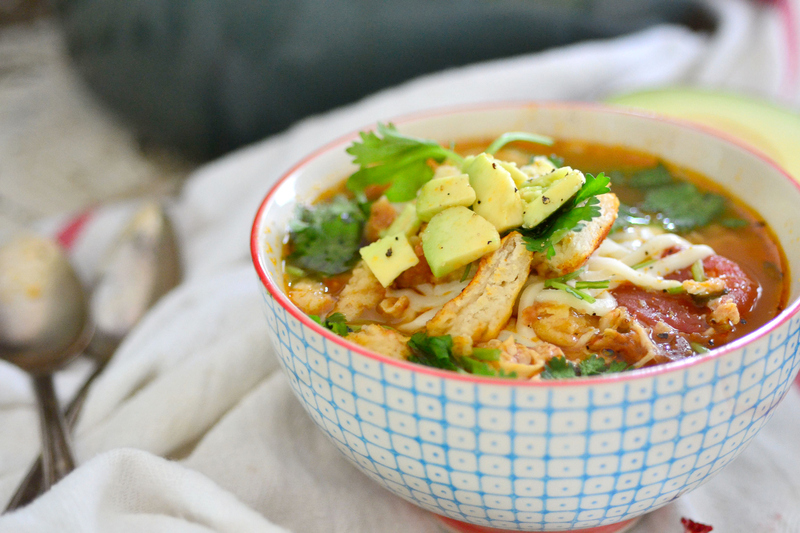 And this easy chicken tortilla soup falls right into that bucket. I made it a few weeks ago and since it’s been made twice. My husband, whose not a huge soup fan, requested it again before I leave for 15 days down under. I love complex, exciting recipes, but I also love simple, easy and flavorful. This soup isn’t just easy, it’s very budget friendly and uses ingredients you probably already have on hand. The best part about it is that it doesn’t taste easy, or budget friendly. It tastes like you spent 14 hours stewing it with the fanciest of ingredients. It just warms your soul, and what’s better than that after a long day. In a large dutch oven, heat the olive oil over medium high heat. Add the shallots, garlic clove, jalapeño, habanero and bell pepper. Cook about 4 – 5 minutes, or until vegetables are softened. Pour in the beer, chicken broth and tomatoes. Bring the mixture to a boil and then reduce to low. Add the shredded chicken, 3/4 cup of the cilantro, 1/4 cup of the basil, salt, pepper, crushed red pepper and the juice from the two limes. Let simmer another 5 minutes and remove from heat. 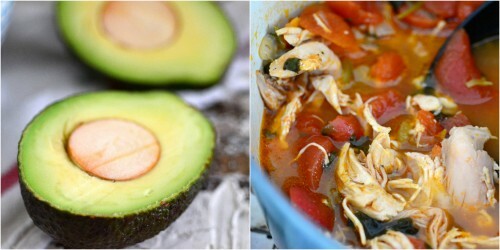 Pour the soup into five bowls and garnish with sliced avocado, shredded cheese and chopped tortilla. Comfort food in a bowl right there - looks awesome! I'm so excited for more soup! 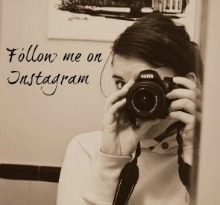 I did :) practically, haha! Yum! 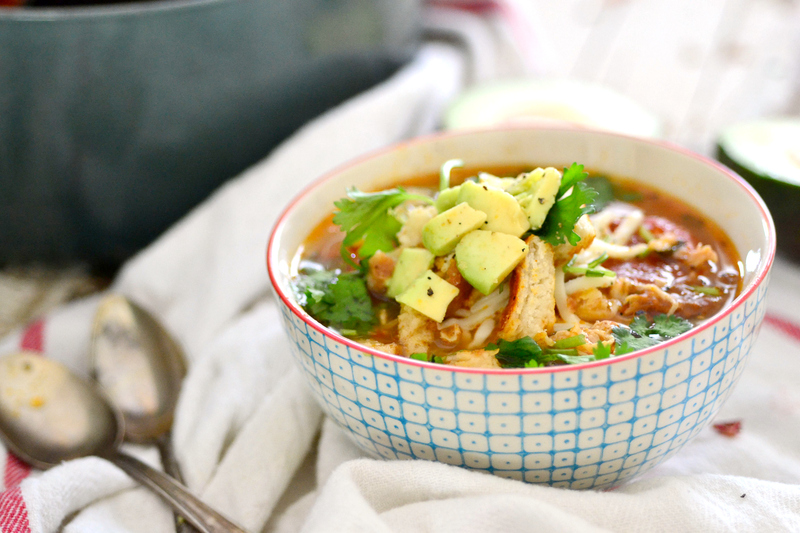 I love tortilla soup and calling it easy only makes it MORE appealing for me! 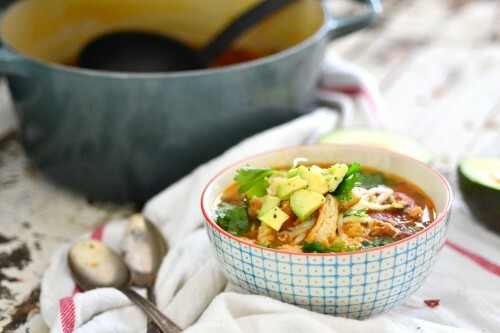 Chicken Tortilla Soup is one of my favorites! Mmmm, Love a good tortilla soup and this one fits the bill - I have not made any yet...waiting for the temps to cool! That's my kind of soup! It looks divine, Claire. Sounds delish! Light. Not a big fan of too many spices in my tortilla soup! 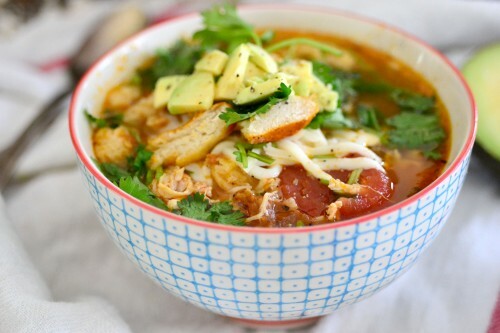 Perfect weather, perfect soup! ! Oh so dreamy! Chicken tortilla is one of my favorites! 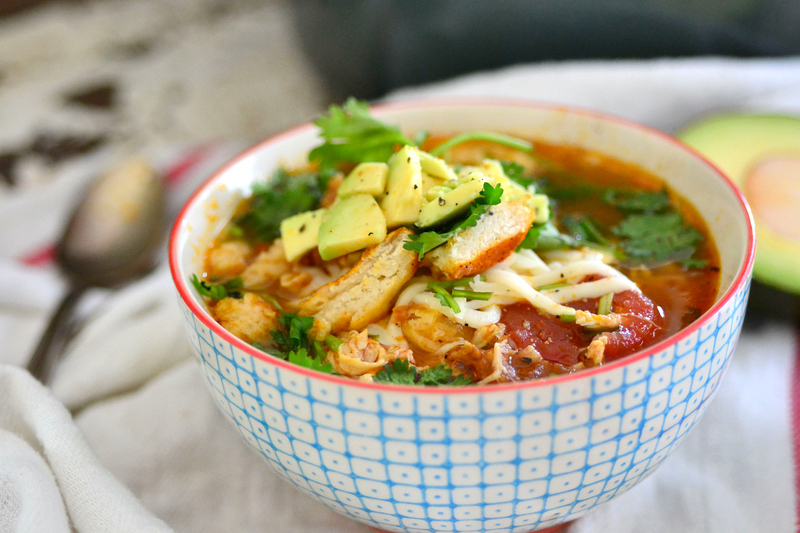 This is one of my favorite soups to eat during the winter. It's comforting and easy to make and the spice heats your right up.